This colour composite image of Arp 261 was created from images obtained using the FORS2 instrument on the ESO Very Large Telescope (VLT), at the Paranal Observatory in Chile. The VeryLarge Telescope has taken one of the best ever images of two galaxies locked ina slow motion, disruptive collision, scientists say. The imagehas also given astronomers a peak at an unusual exploding star in the same areaof the sky. 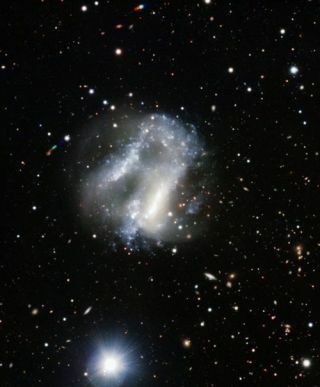 The collidinggalaxies are known collectively as Arp 261, from Halton Arp?s catalogue ofPeculiar Galaxies. With the the FORS2 instrument on the ESO?s VeryLarge Telescope in Chile, astronomers were able to photograph the oddball in greaterdetail than ever before. Arp 261 liesabout 70 million light-years away in the constellation of Libra, the Scales. Itschaotic and very unusual structure is the result of the galactic closeencounter. Althoughindividual stars are very unlikely to collide in such an event, the huge cloudsof gas and dust in the galaxies crash into each other at high speed, leading tothe formation of bright new clusters of very hot stars, which are clearly seenin the picture. The pathsof the existing stars in the galaxies can be dramatically disrupted, creatingthe faint swirls extending to the upper left and lower right of the image. Both interactinggalaxies were probably dwarfs not unlike the Magellanic Cloudsorbiting our own galaxy. The imagesused to create this picture were not actually taken to study the interactinggalaxies at all, but to investigate the properties of the inconspicuous objectjust to the right of the brightest part of Arp 261 and close to the centre ofthe image. This object is an unusual exploding star, called SN 1995N, that isthought to be the result of the final collapse of a massive star at the end ofits life, a so-called core collapse supernova. SN 1995N isunusual because it has faded very slowly ? the glow still shows clearly on thisimage more than seven years after the explosion took place. It is alsoone of the few supernovae to have been observed to emit X-rays. It is thought thatthese unusual characteristics are a result of the exploding star being in adense region of space so that the material blasted out from the supernovaploughs into it and creates X-rays. The imagealso captured two small asteroids from our Solar System that lie between theorbits of Mars and Jupiter and happened to cross the images as they were beingtaken. They show up as the red-green-blue trails at the left and top of thepicture. The asteroid at the top is number 14670 and the one to the left number9735. They are probably less than 3 miles (5 kilometers) across. There isalso a star captured at the bottom of the image. Though it appears bright, itis still about one hundred times too faint to be seen with the unaided eye. Itis most likely a star like the Sun and about 500 light-years from us. Arp 261itself, and the supernova, are about 140,000 times further away again than thisstar. Much more distant still, perhaps some fifty to one hundred times furtheraway than Arp 261, lies a cluster of galaxies visible on the right of thepicture.